A friend of mine (David Walker – who played QB at Texas A&M in the 1970s) is always pointing out interesting stats and facts from the years he played football at Texas A&M. 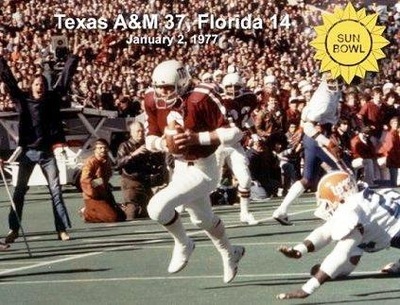 The most recent stat that he brought to my attention is that the 1976 Texas Aggie football team is the only one to: (1) defeat the University of Texas in Austin, (2) win a bowl game, and (3) finish the season ranked in the top-10 (AP No. 7 and UPI No. 8). Three other Aggie teams have come close to accomplishing this particular trifecta, but fell short due to no fault of their own. Those three teams were the 1939 (National Champions), the 1985 SWC Champions, and the 1987 SWC Champions. Each of these three teams (1) defeated the University of Texas at Kyle Field, (2) won their bowl game, and (3) finished the season ranked in the top-10. The only difference being that these three teams played the Longhorns at Kyle Field as opposed to playing them in Austin.